After assessing all the PROs and CONs of each set-ups, after talking to mobile groomers and their daily issues, and after experiencing the ups and downs in the fields ourselves for 6 years, the choice was obvious to go with a self-contained diesel van and generator. We have talked to hundreds of mobile groomers in the past years, and we've listened. Some of you are looking for the most economical set-up to get going, but most of you are looking to buy a solution that will last for years to come, that will be reliable and get you through each day with peace of mind, and that will be economical, in the short and in the long run. We are still working on our conversion and it's not ready for sale just yet. 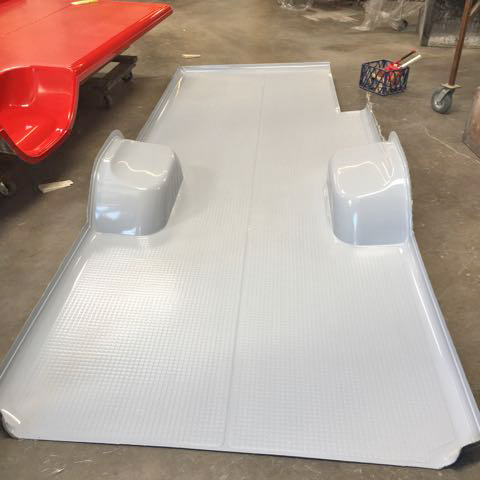 Teknopet's unique offering is a completely slick, waterproof and seamless fiberglass interior. Developing that interior took a long time and as of September 2017, we have completed our molds, so now starts the rigging. We do not want to commit on a timeline, but we are looking to go in testing mode in the first quarter of 2018. The Teknopet team shares its time and talents with another venture, so we naturally use those where contracts are coming from. 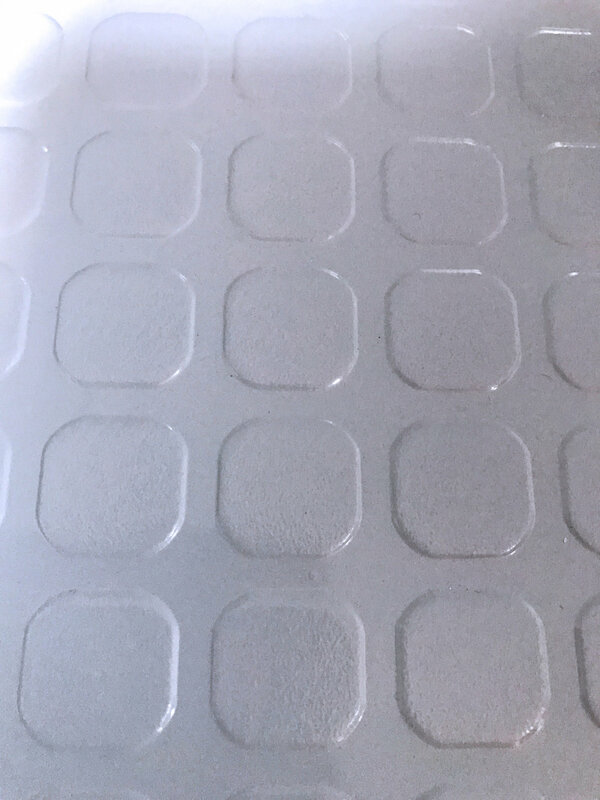 We are working very hard at developing the best solution, which will include the latest technology, easy to clean custom molded fiberglass panels, full containment, etc. We also realize that it's impossible to design a set-up that pleases everybody, so that's why we will do our best to give you as many customizable options as possible. We can't reinvent the wheel, but we are doing our best at making it spin a different way. It's diesel, so much more efficient, economical and durable than a gas vehicle. Fuel economy for both van and generator. 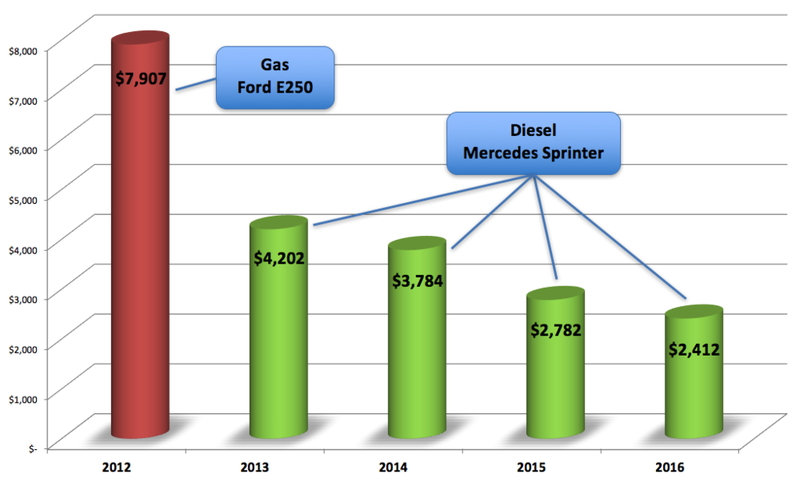 The graph in this section is the real life example of going from a gas van to a diesel one, while serving the same clientele in the same area of a 5 miles radius (Nathalie's business in West LA). The reduction in diesel expenses from 2013 to 2016 is due to the diesel price going down, as well as securing a better schedule/better routes with time, but still grooming an average of 30 dogs a week. Contrarily to most people's first reaction, the Mercedes Sprinter chassis is not much more expensive than other brands, it's actually very similar. The service can be expensive though, but you can buy the extended warranty which will give you peace of mind for years to come, covering regular maintenance and warranty repairs. Mercedes will work with you/us to finance the conversion, other brands will not. We opted for the extended version of the van, not much longer to park, but much more versatile to include all the goodies we are planning. We want to offer privacy for the Porta Potty option. More privacy when you work in the evenings during the winter months, with the lights open, everybody can see inside. Less distraction for the pets. For some pets, seeing outside is a constant reminder that they "could" get out, which makes them misbehave on the table, they bark at dogs passing by, etc. And this vehicle drives, well, like a Mercedes! 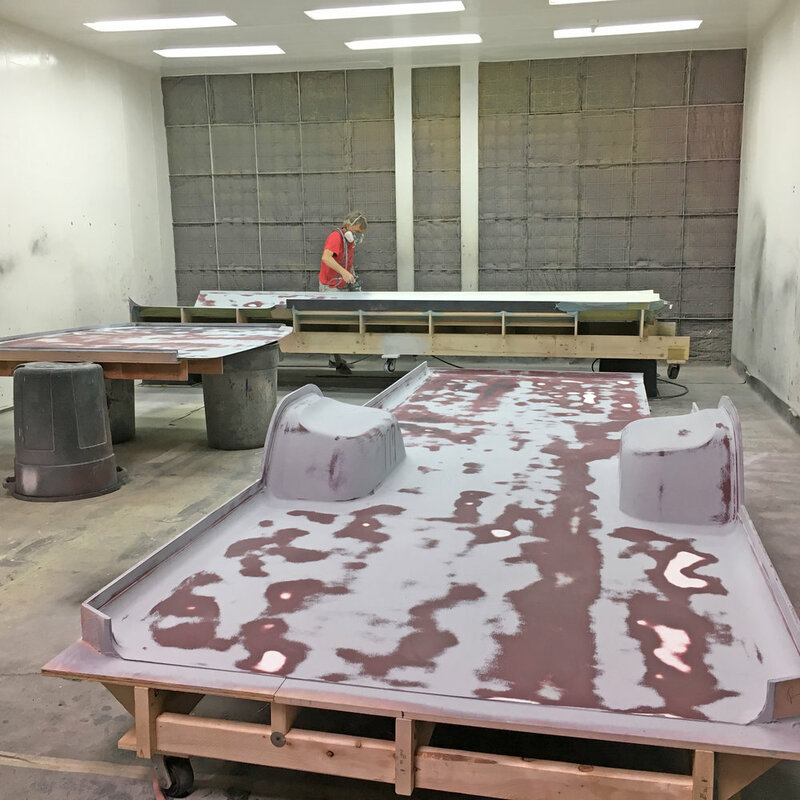 We are very proud of our unique fiberglass, 100% waterproof, color/graphics customizable panels. Not only can they be used for grooming vans, but also for RVs, plumbing trucks, electricians, toy haulers, etc. interlock, no visible screw, and fit perfectly together (no gaps). can be painted any color you wish, although white is favored for maximum brightness when grooming. We can incorporate graphics, logo, etc., and also make them look like wood panels, concrete, etc. Please click here to access all the specs for the Teknopet Conversion - some items are subject to change as we are still in the development phase. 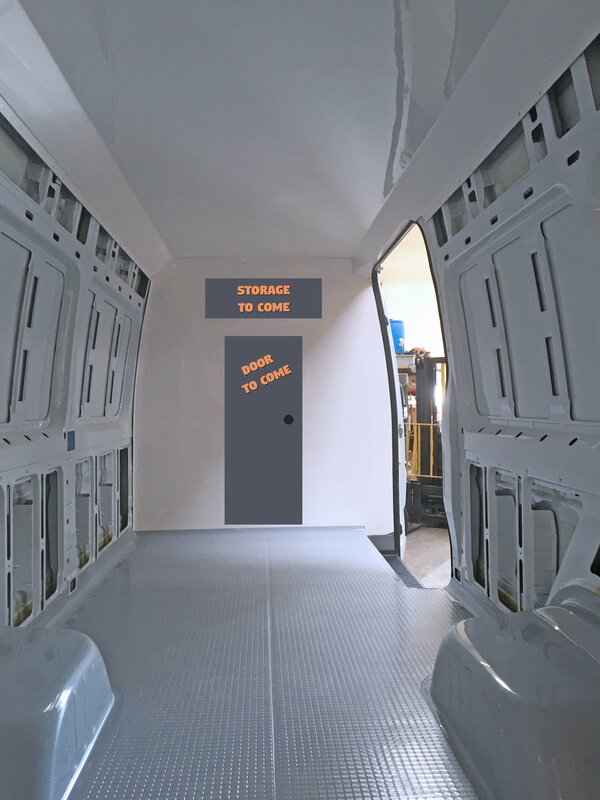 We are designing this van so you can operate at anytime and anywhere. Our conversion will have the most economical set-up with a reliable generator, inverter and battery bay, providing plenty of power for all your needs. Some like to stop to eat, some prefer working through lunch and eat on the go. In any case, it is awesome to have a refrigerator and microwave on board. It allows you so much more flexibility, gives you access to cold beverages at any time, cold/hot food, and saves a lot of money as convenient stores and restaurants get expensive very quickly. You will also be able to relieve yourself without having to find a restroom along the way, and also save time doing so. Think about all the places you've stopped at that didn't have a public restroom (or a disgusting one), all the time you've lost making the detour/parking/waiting in line, and all the discomfort you've experienced of holding it in. We are designing our conversion in order to fix this problem. Once you receive the Excel file from Teknopet, just type your own data in the yellow cells. We haven't locked/protected any cells, so if you type something outside the yellow cells, it may affect the formulas, therefore the results may not be accurate. Please let us know if you need help with this form, we are there to help you figure things out and make sure you'll be successful. Charge what you feel is right for the amount of time you'll spend on a particular grooming (a 20 minute session for Chihuahua compared to a 2 hour one for a Goldendoodle). Don't forget to include the cleaning time you'll need after the grooming, it can be quite extensive after a de-shedding. 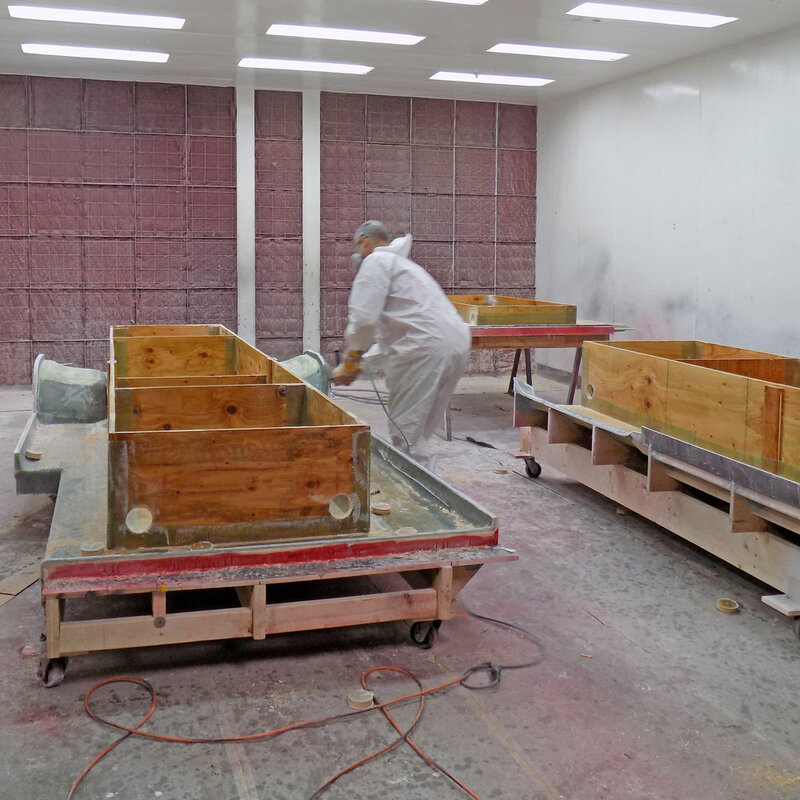 The same people with decades of experience as award winning boats manufacturer are designing and manufacturing the Teknopet conversion. 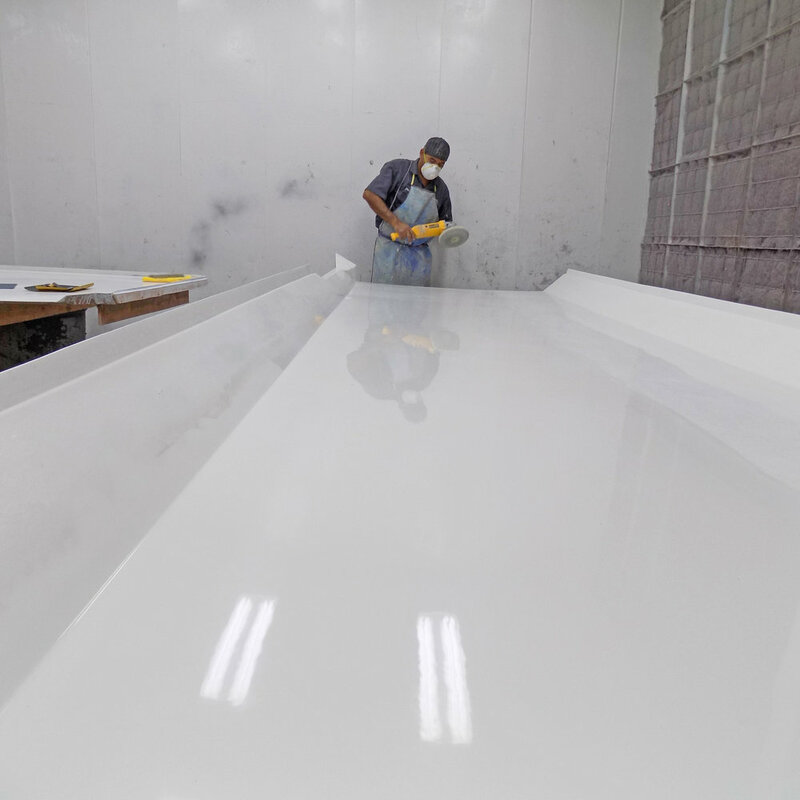 We are used to dealing with water, have access to the best technology/equipment for water conditions, and use high-end marine grade quality materials. Our floor will be easy to maintain and will not have vinyl baseboards that rip, catch/trap hair and dirt, as well as get damaged after just a few months. Our cabinets will be mounted a few inches off the floor, so it will be very easy to clean, especially with the curved edges. 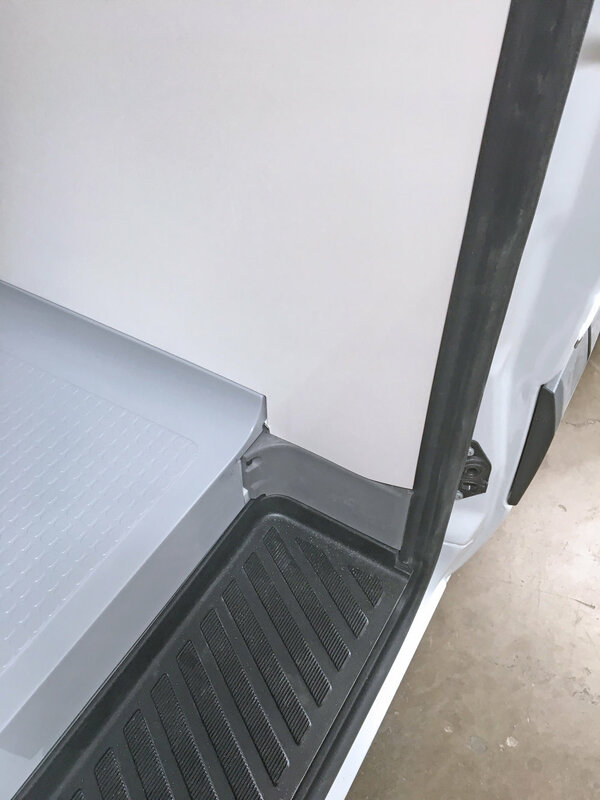 Our smooth custom fiberglass panels will allow for very easy maintenance, and will keep your van looking new for years to come. 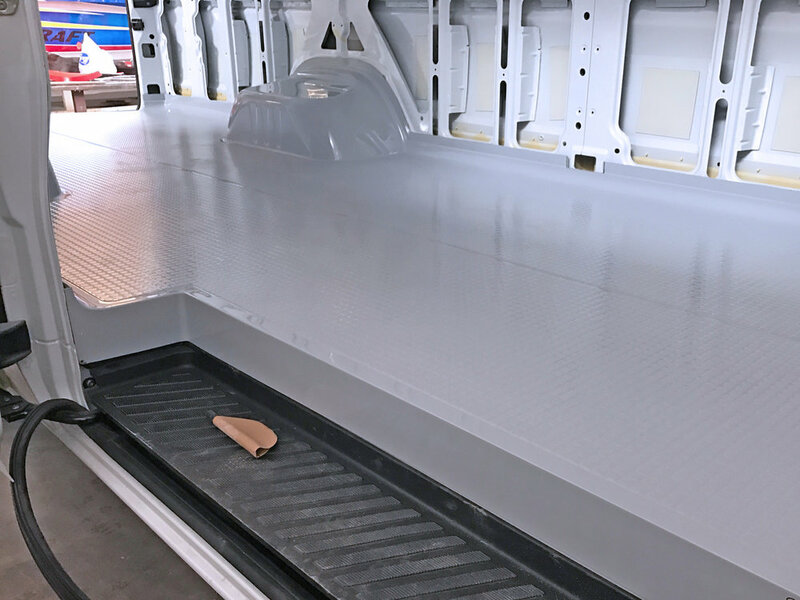 The van's interior only have 5 pieces (ceiling, 2 walls, floors and front cab separator), compared to the hundreds of pieces in our current competition. We will maximize the storage space inside the van. All switches will be located in very convenient places, regrouped for when and where you need them. We will not drill holes and install accessories where you don't want them (blade rack, etc). We will work with you and only install what you want, and where you want it. We know that buying a new van is nerve racking and a lot of money is on the line. Teknopet doesn't offer direct financing at the moment, but we are working with Mercedes-Benz/Daimler, allowing you to finance the whole conversion. Want to Focus on Cat Grooming? Have you thought of cat grooming? It's pretty big on the East Coast and Canada, and it's slowly catching up on the West Coast. Actually, there is a serious lack of mobile cat groomers for the demand in the Los Angeles area as far as we know. Cat grooming is not for everyone, but when trained properly, one can be very successful. "I've had the tremendous luck of experiencing different types of settings in my grooming career, from having a grooming salon back in Canada, to buying a used grooming van after living in California for a few years, and then purchasing a brand new grooming van. All those set ups have allowed me to evaluate what are the basics and what is luxury, in my point of view anyway. And through all those experiences, I've become much more efficient ... and demanding. I would love to say that the purchase process of my new grooming van three years ago was great, but it was unfortunately not. I won't go into details, it's bad karma, but I'm bringing this up as I truly believe in the saying "treat others the way you want to be treated", and at Teknopet, we want to do just that. We will not push anything down your throat, nor will we make you feel cheap. We are determined to give you the best experience there is and total respect."